Click the button below to add the Powermate 5,000-Watt Gasoline Powered Portable Generator with CARB (California compliant) to your wish list. 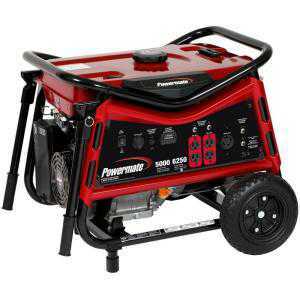 This Powermate 5,000-Watt Gasoline-Powered Portable Generator helps provide you with a backup power source in case of emergencies or power outages. This generator features a 6.5-gallon fuel tank that runs continuously for up to 11 hours at half load for long-lasting use. An automatic shutoff feature powers the generator down when oil levels are low to help protect the engine from damage.